Pointing your phone's camera at yourself and just snapping a picture is so amateur—especially when you're competing in the Selfie Olympics. 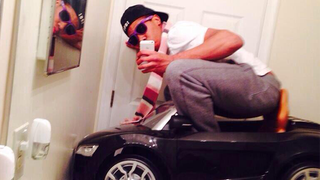 You see, the Selfie Olympics are all about taking the most awesome, ridiculous selfies. Taking a simple selfie just won't do. You've got to go all the way. You can see more absurd selfies here. And if you've got some good selfie game, or think you can compete with some of these selfies—by all means, share!